Home > Found an Injured Marine Animal? > Found an Injured Turtle? Q. What should I do if I find a sea turtle on the beach or entangled? Q. If the turtle is on its back should I turn it over? A. Yes, be extremely careful when lifting these animals and be mindful of the flippers as they can slap very hard. Q. If the animal is entangled should I cut it free? A. If the entanglement has cut through the skin its best to leave the entanglement on the animal for the time being. If the entanglement has cut through an artery and is cut free the animal could bleed out and die within minutes. Q. Do I keep the turtle covered with a wet towel? A. If the weather is cold and windy NO. This can decrease the turtles core temperature even more. If it is windy and cold it is best to cover the turtle with a dry towel (do not cover the animals head) and again, be mindful of the flippers as they can cause you harm if hit by them. If the weather is hot and sunny then cover the animal with a wet towel and shade the animal as much as possible. 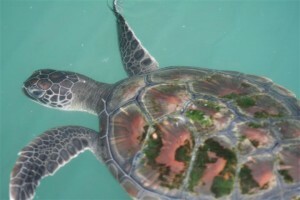 Sea turtles are not commonly found in South Australian waters but they have been known to wash up from time to time. These animals are normally what we call “floaters”. Floating turtles are unable to maintain their desired geographical location due to floating on the surface. Wind, tides and currents blow these animals away from warmer waters and they often wash up a long way from home. Floating is caused by gut impaction; this is when the turtle has eaten something it shouldn’t have like hard plastics that block the lower intestine and causes the gut impaction. Everything the turtle eats thereafter is unable to be digested and starts filling the intestines with digested food and at times more plastic. The gastrointestinal tract then becomes infected and inflamed; the food that is not being allowed to pass through the intestine starts to develop gases that lifts the animal to the surface – hence the name “floater”. These animals require immediate attention and if left much longer will die a painful death. Please keep children and dogs away from this animal at all times as noise and excess movement will increase the turtles stress levels. Stress is extremely important to keep at an absolute minimum at this point in time as an increased stress level can and will kill this animal if mistreated.